Specifically designed to supplement laboratory exercises 4, 5, 6, and 7 of your AGI/NAGT Laboratory Manual in Physical Geology, this unique set of 36 different rocks provides excellent examples of the many key igneous, sedimentary, and metamorphic lithologies. Identification becomes an interesting hands-on experience when you use Ward's® Rock Set, housed in a compartmented collection box with an accompanying identification list. 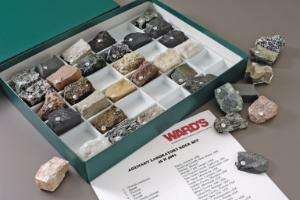 Contents: 36 numbered samples, 1 x 1" to 1" x 11/2"
Ordering information: Contents include andesite, arkose, basalt, breccia, chalk, coal (2), conglomerate, coquina, diorite, dolostone, gabbro, gneiss, granite (2), gypsum, lignite, limestone, marble (2), metaconglomerate, obsidian, peridotite (2), phyllite, pumice, quartz, quartzite, rhyolite, sandstone, scoria, serpentinite, shale, schist (2), and slate.